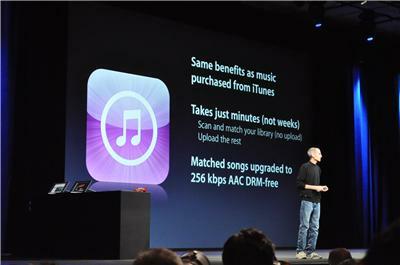 Apple CEO Steve Jobs just announced his infamous “one more thing” at WWDC and it’s iTunes In The Cloud-related; iTunes Match will upgrade your ripped songs to 256 kpbs AAC DRM-free for a $24.99 yearly subscription. Basically iTunes Match will scan a users iTunes library for any music you haven’t bought through iTunes and subscribers will be able to get a high quality copy of those songs for iTunes In The Cloud. “It takes just minutes. Not weeks,” said Jobs on the turnover time to upgrading your music, using hyperbole to poke fun at competitors Google and Amazon who have also recently launched their own cloud services. So Apple’s basically betting you’ll pay $25 a year to legalize all your content, and for the convenience of having it with you everywhere. Guess that’s better than losing the $25 you weren’t paying Apple before.